I know I’ve mentioned my addiction to Facebook on this blog several times. I almost think I can dedicate a whole category to “Facebook Inspired” recipes and creations…this one being one of them. I saw this recipe posted on Facebook last week on Food Network’s fan page and I immediately bookmarked it. I thought a festive sweet bread like this would make a nice addition to our Thanksgiving meal, and I was right. 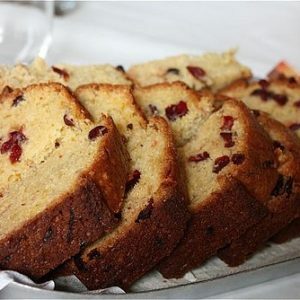 The flavor combination of orange and cranberry is just perfect…and it couldn’t have been easier to bake up at almost the last minute – which is why I’m a huge fan of quickbreads. When I first saw the recipe I didn’t realize that I would need a food processor to make this bread. It wasn’t until after I got all my ingredients in order that I hit a road block. I don’t have a food processor! Actually, I have a mini one (that I purchased a couple of years ago when I was really into making purees)…but the mini one just doesn’t do the job for most recipes that call for a food processor. So it’s official. I am asking Santa for a food processor this year. What kind should I get? Help! So how did I get past the “crap, I don’t have a food processor moment”? Well, I improvised by using my hands. Isn’t that what they probably did back in the day? I basically used my fingers to cut up the cold butter and blend it with the flour. Ann Burrell mentions in the recipe that the mixture should resemble “grated cheese”…and that’s the result I got as I was mixing with my hands so I went with it. And it worked! But I still want my food processor. Next Post » Two Awesome Veggie Sides…and a Blogger Tip! What a great quickbread! I love those flavors so I know I’ll be making it soon as well! I’ve got the kitchenaid food processor and love it! shop around and see what you like. Mine is easy to clean – even if I have to handwash due to my dishwasher being full! It looks so moist and delicious! Anne Burrell is my favorite chef on the Food Network these days. I like her food sensibility. Plus, she’s loud. 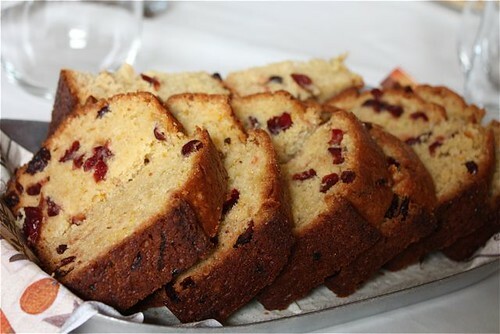 Nice job improvising 🙂 What a yummy quick bread – cranberry and orange are so perfect together! I totally do that with recipes all the time (fail to realize I don’t have something the recipe calls for). Looks like you made it work well though. The bread looks cooked to perfection. And this is a bread both kids and adults can love. Fabulous! 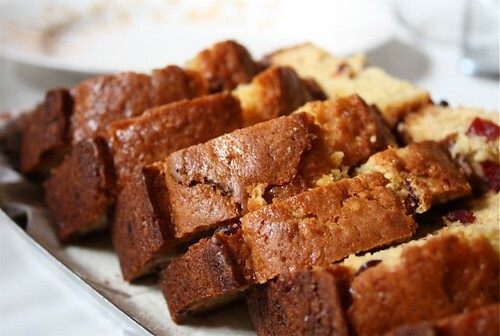 I also love quick breads and this one is so perfect for the holidays. Good thinking using your hands. I don’t have a food processor (only mini one too). One day it will be on my Santa list. Tell Larry to get you this one by Cuisinart. I’ve been seeing ads for it and it comes with 3 different bowl sizes. Yes, definitely the Cuisinart. Size is your preference, mine is the middle one. And I really dig this bread. You really did make it nice and moist. I’m so into baking lately, I may add it to my list. keep an eye out on http://www.shopkitchenaid.com. Every Monday they offer a deal of the week for SUPER cheap. this week I got their AWESOME 9 speed mixer for $39. It is usually $89!!!! Crazy good deal. Monday is the lowest price and then on Tuesday they jack the price up a bit. Or maybe Santa will get you your food processor! It looks so moist! I have never had a quick bread recipe that required a food rpocessor but it looks worth it! Hooray!! 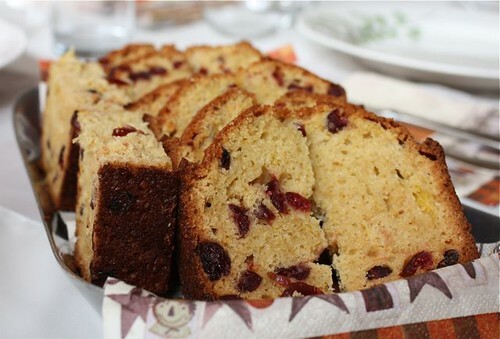 I’d actually been wanting to find a good cranberry bread recipe this fall. It was my absolute favorite bread growing up, but have somehow never tried it on my own. Look forward to checking out this one – thanks! Don’t get a food processor. It’s huge, bulky (another word for huge), takes up so much space (huge again), is a pain to get out, put together and then clean. Ugh, by the time it’s all said and done you could have done it by hand. Work those muscles! They didn’t have food processors back in the day…or gyms!